Recovery is an essential cornerstone of health. Sleep and renewal habits have huge implications for your performance, energy, brain, healing, health and longevity. It is the single most significant behavioural pattern that you have. Many people wrongly assume that nothing is happening when they are resting, simply because they don’t feel much. The truth is that during times of active rest your brain is working hard running the processes that rebuild and renew your cells. It is during these periods of rest that your brain and body detoxify, reboot and heal from the demands of the day. Many people are unaware of the importance of maintaining this balance and simply assume that rest is optional, continuing to push their body systems too hard, both intentionally through work or sports, and unintentionally through lifestyle. In this blog post, I am going to look at one of the up and coming stars of functional assessment called Heart Rate Variability (HRV). I’ll show you how this one measurement may be the most useful data that you can collect to assess your current state of health and future health-span by revealing vital information on how well you are recovering. When you reduce health down to the most fundamental elements, it revolves around the conversation of stress; how much of it you get exposed to and how well your body handles it. It is now undisputed in the scientific literature that the cornerstones of a healthy life and wellbeing are lifestyle related choices and behaviours. There is extensive research showing that appropriate physical exercise and activity (1), restful sleep, a healthy diet and avoidance of toxins all support recovery from stress both day-to-day and long-term (2,3). The challenge for many people is that even though these health factors are well known and understood they remain offset by stressors. Emotional stress, poor sleep, sedentary living, chronic pain, obesity and westernised eating habits are all significant forces that increase the risk of severe chronic illness and reduced quality of life (4). There are many different forms of stress that fall under a combination of environmental factors, such as your social, economic and physical environments (your work demands, personal finances, family obligations, major life events, social pressures and ideals) as well as lifestyle-related factors (such as your eating, sleeping, exercising and self-care habits). This overall stress burden comes together to form what is known as your allostatic load. It is easy to see how complicated the situation can become and how many different aspects of our lives can converge together to create adverse health effects. There is, however, a common misconception that all stress bad and should be eradicated, which is not the case. In fact, short-term stress is essential for survival, allowing us to adapt to the pressures and strains of life. It is better to consider short-term ‘good stress’ as the type that is reasonable and helpful, allowing us to rise to the demands of life. The problems arise when stress becomes more long-term where it has been shown to contribute to practically every chronic illness, from heart disease to immunological diseases (6-7). Chronic stress is also an important factor in chronic pain, anxiety, depression, digestive problems and autoimmune diseases. The important element to understand in your health is not just how much stress you are getting exposed to and for how long, but also how well your body can adapt to this stress and get back into a natural state of balance after it has ended. The process where your physiology naturally balances is known as homoeostasis. Coming from this perspective, it becomes clear that most important and useful measure of health may well be this internal ‘adaptability’ to stress. Heart rate variability is a promising advancement in technology and lifestyle assessment that allows you to ‘check your status’ so to speak, and see the ‘real time’ effects of stress on your body from the demands you are placing upon it through behaviours and environment. To understand how HRV works, we first need to look at how your nervous system, which is responsible for managing your health in response to the changes in the environment and adapting your body to stress. The incredible nervous system consists of a central nervous system and a peripheral nervous system. The latter which is made up of two components, the voluntary and autonomic nervous systems. The voluntary nervous system is mostly responsible for movement and sensation, whereas the autonomic nervous system, which is subdivided further into the sympathetic and parasympathetic divisions, is in charge of regulating the unconscious parts of your health, such as breathing, heart rate and digestion. 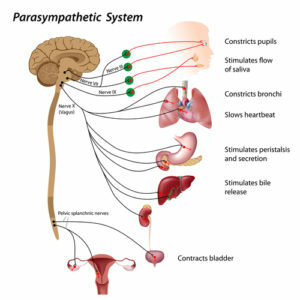 The sympathetic and parasympathetic systems work in opposition to each other. Think of your sympathetic nervous system as being like ‘superman’; it prepares the body to fight by accelerating and ‘powering up’ bodily functions. Whereas your parasympathetic system is like a ‘yoga guru’, primarily involved in rest, relaxation and maintaining organisation. When you experience stress, there is a response from your body to cope with it. Regardless of whether it is a positive ‘get the job done’ stress or a negative stress from emotions and reactions, the physiological response is similar:” An immediate release of stress hormones results in an increased rate and force of contraction of your heart (amongst many other changes). One of the best, simple, definitions of stress is ‘a failure to adapt to a changing environment’. This applies to both your emotional response to life and the physiological response of your nervous system to life. The more adaptable you are, the more robust your health is. To summarise all of that, during more stressful times, such as working or exercising, your body needs to be able to utilise more sympathetic activity to meet the demands of the task. Whereas parasympathetic activity should be taking over during periods of resting, eating or sleeping. This ability to switch between the two sides of your autonomic nervous system (ANS) reflects your adaptive ability. You can immediately experience the link between your autonomic nervous system and your physiology by changing the way in which you breathe. Your diaphragm can affect autonomic activity through the manner in which you control your breath. Try deeply breathing in for a count of 3 followed by a rapid exhalation of 1 second. Repeat this 5 or 6 times and then notice how you feel. This manner of breathing will stimulate your sympathetic nervous system and ‘rev you up’, you should feel more focused and energised. Then, try the opposite. Breath in deeply and quickly for a count of 1 and then breathe out slowly for a count of 3. This type of breathing will stimulate your parasympathetic nervous system and cause you to feel calm and relaxed immediately. By learning to breathe deeply and diaphragmatically, you can exercise a lot of control over your autonomic nervous system and the effect that it has on your physiology and health. 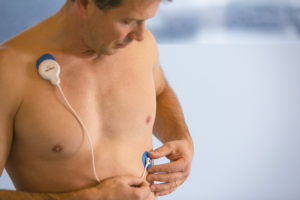 Quick HRV tests – we used to do this at SpineCentral until it became very clear that stress varies from moment to moment and to get an accurate understanding you would have to do either many individual readings and take an average or a do a longer assessment over several days rather than minutes. Hormonal measurements – such as salivary or serum hormonal profiling. These are also very useful, and something that we offer at SpineCentral to assess important hormones involved with handling stress, such as cortisol and DHEA. These tests can give an interesting profile of the state of Hypothalamic Adrenal Pituitary (HPA) Axis but they are cumbersome to perform, expensive, and the timing of the samples may be affected by the strong natural rhythms of normal hormonal secretion. Psychological questionnaires – useful, but can be significantly skewed by personality. Blood pressure – Also useful but cannot easily be measured continuously, which is what is required to get a complete picture of your stress response. Skin conductance – We used to measure this as well but found that external variables like the temperature and humidity of the room or the recent activity of the individual, and the significant drawback is that it cannot be measured continuously through physical activity. The current best method to assess your stress load and ability to recover is heart rate variability measured over several days and compared against a diary of your lifestyle (i.e. sleeping, eating, training and working times). We have seen how the ANS plays a role in regulating the heart rate according to what is needed at any given time. Heart rate varies from moment to moment depending upon the demands placed upon it. Breathing, for example, has a direct influence, speeding up the heart rate on inspiration and slowing it down on expiration (a phenomenon known as respiratory sinus arrhythmia). The moment to moment fluctuation in heart rate is called heart rate variability. During tines of stress, the sympathetic nerves boost heart rate by up to two to three times the resting rate. The parasympathetic nervous system slows down the heart rate (through the vagus nerve) to restore balance after stress or exercise. Studies have shown that higher HRV is associated with lower morbidity and mortality (14,15) psychological well-being and quality of life (16), as well as better physical fitness and lower age of the individual (17). It is perhaps not surprising to note that the evidence shows that acute stress has been associated with reduced HRV during sleep (18) and daytime (19). The same correlation with work stress and reduced HRV has been shown in multiple studies (20-23). Why Would You Measure Heart Rate Variability? Studying the heart provides a vast amount of information about the body. The aim of measuring of an HRV assessment is to increase a person’s understanding of the important aspects of life that either causes stress or promote recovery and relaxation. It also gives feedback on the way that physical activity affects physiology regarding intensity, duration and recovery effect. The ultimate benefit is found in helping the individual find a better balance between work and leisure time, exercise and renewal, stress and recovery. The goal is not to eradicate all stress from life, because that is impossible (and would be unhealthy on the other end of the extreme), but rather on creating sufficient rest and recovery and finding a healthy balance in the rhythm of life. The assessment is also of particular value for athletes where it can be used to assess competition stress, monitor training load and analyse the level of recovery attained to optimise training and performance in competition while avoiding overtraining in the process of pushing hard. There are many different HRV technologies and systems on the market these days. Some are better than others, but the idea is to use HRV equipment that monitors your heart rate and rhythm over time, collect the data and analyse it against your lifestyle so that you can see how your particular lifestyle is being handled by your particular body. The technology that we use at SpineCentral to measure HRV over a period of 3-5 days is called Firstbeat. It is a straightforward system that is easy to use and works automatically once you connect it to your body. That’s the fun ‘sciencey’ part; you get to stick EMG electrodes to your skin and connect up the small Firstbeat computer to it and then go about living your normal life while the technology works away in the background collecting valuable data. All you have to do is fill out a simple lifestyle diary over the same period. I recently interviewed Dr Carlyle Jenkins, one of Londons most forward-thinking wellness Doctors on his approach to improving resilience and greater performance in the elite sportsman and high flyers that he treats. You can access the interview here and learn how he has utilised the Firstbeat technology to gain valuable insight on his patients and guide the healing process. When you receive the HRV Lifestyle Assessment Report, you can see with some clear, colourful graphics how your body is responding to your lifestyle stress load. The times when the lines are red mean that you were in sympathetic ‘superman’ mode. The times when the chart is green reveal the parasympathetic ‘yoga guru’ relaxation mode. How the use of alcohol or foreign travel affects your adaptability. It is very insightful and reveals information that you would ordinarily never find out about yourself. Interestingly one of the most common findings that we see with this assessment is the effect that even just one glass of wine has upon sleep quality. Typically the results show restless sleep and reduced time in parasympathetic recovery mode throughout the night. This, as well as other patterns that get revealed, can be instrumental in gaining the leverage and understanding required to shift your health in a new positive direction. To tie it all together, when you run HRV over a period of 3 to 5 days and compare the data alongside a lifestyle diary that reveals the patterns of life you can gain some very useful and important information about your health. • The 24-7 assessment in daily life brings out lifestyle factors that support or impair well-being and good performance and helps identify the causes of overload, stress or poor recovery. 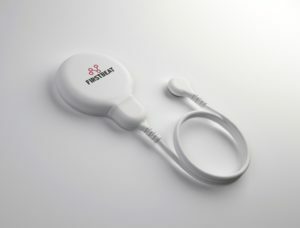 For more about HRV and Lifestyle Assessment check out www.firstbeat.com. The video below also explains the process well. 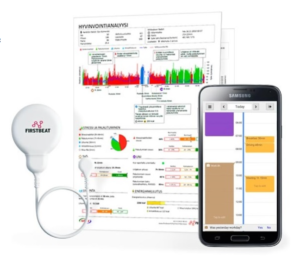 We are thrilled to announce that SpineCentral now has the Firstbeat technology in house and have begun assessing both new and existing patients with this valuable tool. Now I’d like to hear from you. Have you ever used HRV to assess your recovery from lifestyle stress? Do you use any other methods or technologies to work out how well rested you are? If so, have they been helpful? Have you had success with improving your recovery and renewal in general? What else has worked for you? Let us know in the comments section. Haskell WL, Blair SN & Hill JO (2009). Physical activity: Health outcomes and importance for public health policy. Preventive Medicine 49 (4): 280–282. Porkka-Heiskanen T, Zitting KM & Wigren HK (2013). Sleep, its regulation and possible mechanisms of sleep disturbances. Acta Physiologica (Oxf), 208 (4): 311–328. Poli A et al. Moderate alcohol use and health: a consensus document. Nutrition, Metabolism & Cardiovascular Diseases, 23 (6): 487–504. World Health Organization (2012). The European Health Report 2012 – Charting the way to well-being. Schulkin .Allostasis, Homeostasis, and the costs of physiological adaptation. 2004. Cambridge University Press. Segerström SC & Miller GE (2004). Psychological Stress and the Human Immune System: A Meta-Analytic Study of 30 Years of Inquiry. Psychological Bulletin, Vol. 130, No. 4. Schneiderman N, Ironson G & Siegel SD (2005). Stress and Health: Psychological, Behavioural, and Biological Determinants. Annual Review of Clinical Psychology, Vol. 1: 607-628. Koolhaas JM et al. (2011). Stress revisited: a critical evaluation of the stress concept. Neuroscience & Biobehavioral Reviews, 35 (5): 1291–1301. Radak Z, Chung HY, Koltai E, Taylor AW & Goto S (2008). Exercise, oxidative stress and hormesis. Ageing Research Reviews, 7 (1): 34–42. Task Force of the European Society of Cardiology and the North American Society of Pacing and Electrophysiology. (1996). Heart rate variability: standards of measurement, physiological interpretation and clinical use. Circulation 93: 1043–1065. Martinmäki K, Rusko H, Saalasti S & Kettunen J (2006). Ability of short-time Fourier transform method to detect transient changes in vagal effects on hearts: a pharmacological blocking study. American Journal of Physiology – Heart and Circulatory Physiology 290, 2582– 2589. Acharya UR, Joseph KP, Kannathal N, Lim CM & Suri JS (2006). Heart rate variability: a review. Medical & Biological Engineering & Computing 44: 1031–1051. Sajadieh A, Wendelboe Nielsen O, Rasmussen V, Hein HO, Abedini S & Fischer Hansen J (2004). Increased heart rate and reduced heart-rate variability are associated with subclinical inflammation in middle-aged and elderly subjects with no apparent heart disease. European Heart Journal, 25 (5): 363–370. Stein PK, Domitrovich PP, Huikuri HV & Kleiger RE (2005). Traditional and Nonlinear Heart Rate Variability Are Each Independently Associated with Mortality after Myocardial Infarction. Journal of Cardiovascular Electrophysiology, 16 (1): 13–20. Geisler FCM, Vennewald N, Kubiak T & Weber H (2010). The impact of heart rate variability on subjective well-being is mediated by emotion regulation. Personality and Individual Differences, 49, 7: 723–728. De Meersman RE (1993). Heart rate variability and aerobic fitness. American Heart Journal, 125 (3): 726–731. Hall M, Vasko R, Buysse D, Ombao H, Chen Q, Cashmere JD, Kupfer D & Thayer JF (2004). Acute stress affects heart rate variability during sleep. Psychosomatic Medicine, 66 (1): 56–62. Dishman RK, Nakamura Y, Garcia ME, Thompson RW, Dunn AL & Blair SN (2000). Heart rate variability, trait anxiety, and perceived stress among physically fit men and women. International Journal of Psychophysiology, 37: 121–133. Clays E, De Bacquer D, Crasset V, Kittel F, de Smet P, Kornitzer M, Karasek R & De Backe G (2011). The perception of work stressors is related to reduced parasympathetic activity. International Archives of Occupational and Environmental Health 84: 185–191. Vrijkotte TG, van Doornen LJ & de Geus EJ (2000). Effects of work stress on ambulatory blood pressure, heart rate, and heart rate variability. Hypertension 35, 880–886. van Amelsvoort LG, Schouten EG, Maan AC, Swenne CA & Kok F. (2000). Occupational determinants of heart rate variability. International Archives of Occupational and Environmental Health 73, 255–262. Collins SM, Karasek RA & Costas K (2005). Job strain and autonomic indices of cardiovascular disease risk. American Journal of Industrial Medicine 48, 182–193. Stress and Recovery Analysis Method Based on 24-hour Heart Rate Variability – The White Papers – Firstbeat Technologies Ltd.